As Only She Will Be Able To Help Us. The goal of this movement is to get as many people as possible to add “the end of abortion, contraception, and euthanasia to their daily intentions when they pray the Holy Rosary. All you have to do is to commit to pray five decades of the Rosary per day and if you already pray it, just add the intention "for the end of abortion, contraception, and euthanasia to it. If you sign up and you are a member of a pro life organization or Catholic institution we will promote your organization/institution if you like by adding your name and organization/link to our member’s page. Your email will be kept private for use only by the End of Abortion Movement to notify you of important events/news. 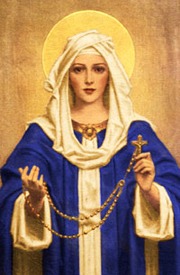 Once you've signed up ask others you know who pray the Rosary to join us. Also if you pray as a family sign them up by adding them in the comments section.